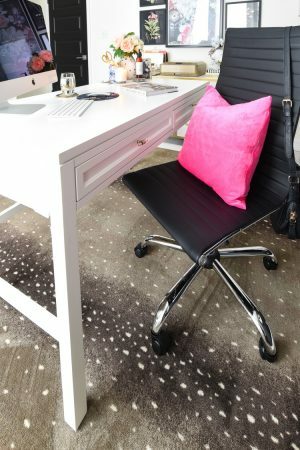 I’m back with my second after market post from my High Point Market trip last month as part of the Design Bloggers Tour! My first post was all about the highlights from each of the gorgeous and impeccably styled showrooms we visited. 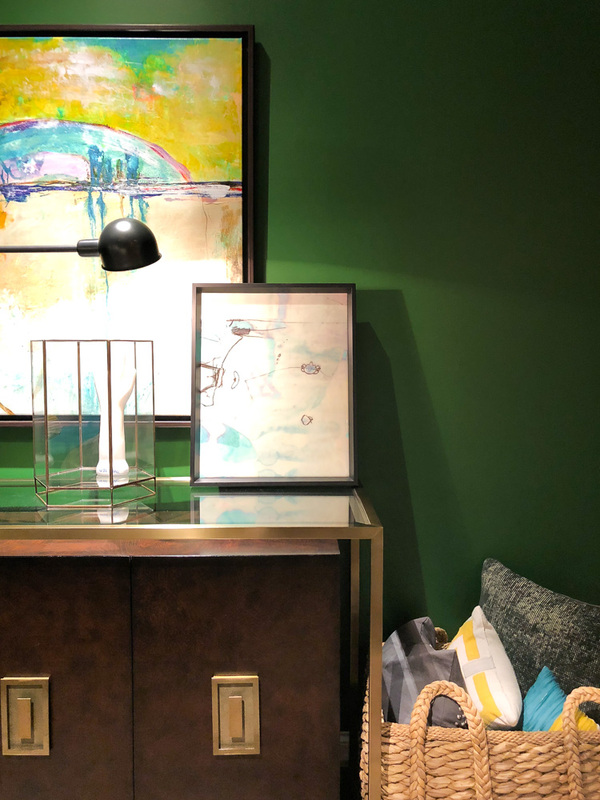 Today’s post is about the three predominant color trends I noticed across several showrooms, and my goal is get to you pumped about injecting some color into your space. Some of the colors are incorporated in a subtle fashion, while others are full fledged in a space, so there’s something for everyone. The three color trends that I noticed the most are: soft purple and violet hues, luscious greens and luxe metallics. 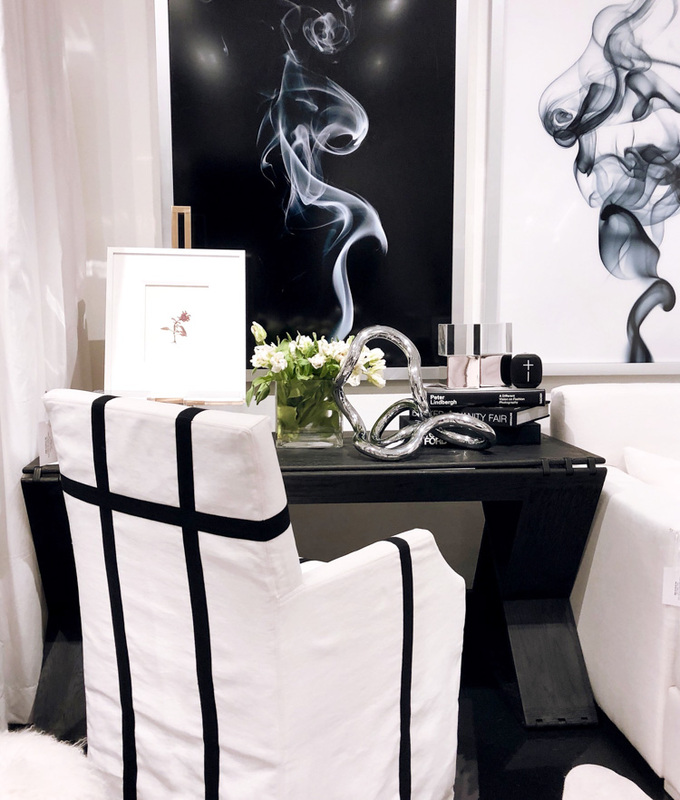 As a bonus, I’m also including some of my fave black and white furnishings/spaces. Let’s dive in. Greens, and I’m not talking about the healthy stuff we should be eating daily, are having a HOT moment right now. I myself tend to not gravitate towards this color, yet lately I’ve been obsessing. 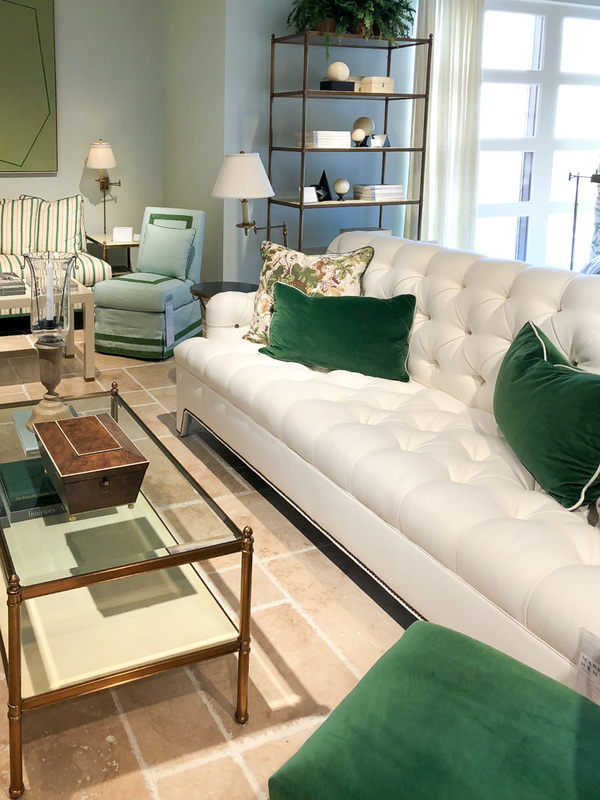 And so were many of the High Point Market showrooms who incorporated every shade from citrine to lime to emerald. This green alcove adorned with blue and white chinoiserie touches in the fabric stopped me in my tracks at E.J. Victor. I legit stood on the side for a long time to wait for people to stop admiring this space so I could snap a pic. 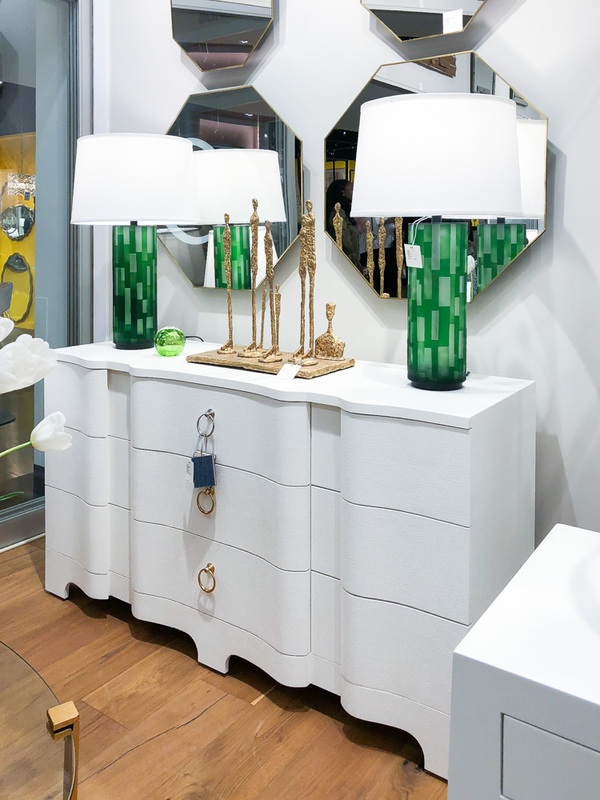 This green is bright, happy and great for a small space to make a big impact. Also at E.J. 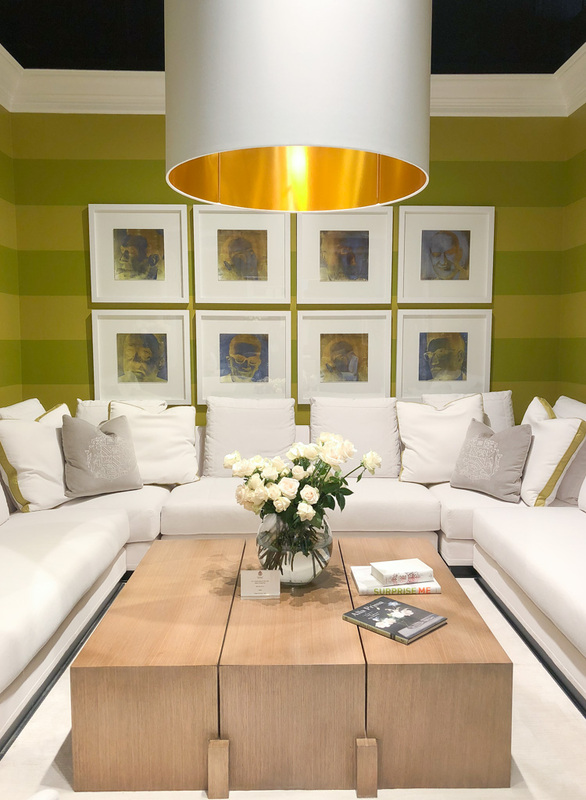 Victor was the following space with green horizontal stripes wrapping around the walls paired with a simple monochromatic accent wall, neutral sofa and oversized drumshade chandelier. Pairing simple furnishings with a powerful accent wall is one of my favorite ways to decorate a space. 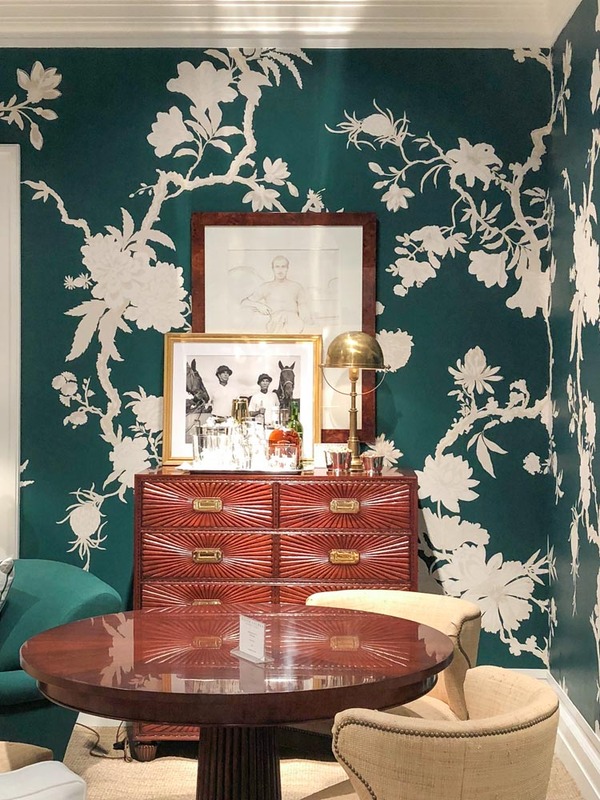 A dark green wall paired with colorful accessories and sleek furniture at Universal Furniture really makes a bold statement. If you want to do a wall like this in your home, I’d highly suggest going with a matte or flat paint finish. Or you can go for it and use a green and white large scale floral wallpaper. Isn’t this just fabulous? Ralph Lauren Home really knocked it out of the park with this wallpaper. So, what if you want to incorporate green without touching your walls? 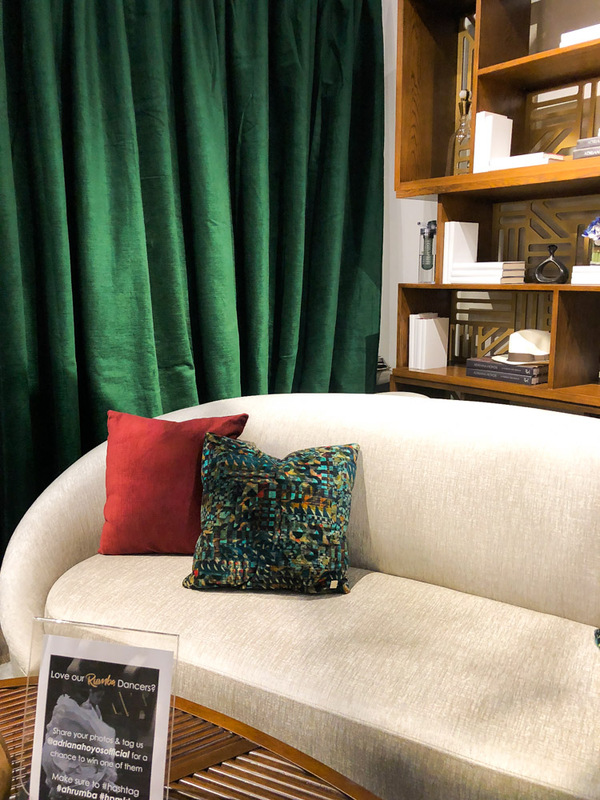 At Adriana Hoyos, I was obsessed with the velvet emerald curtains displayed at the entrance to their space. It was such a bold color that really highlighted their warm and sophisticated furniture offerings. 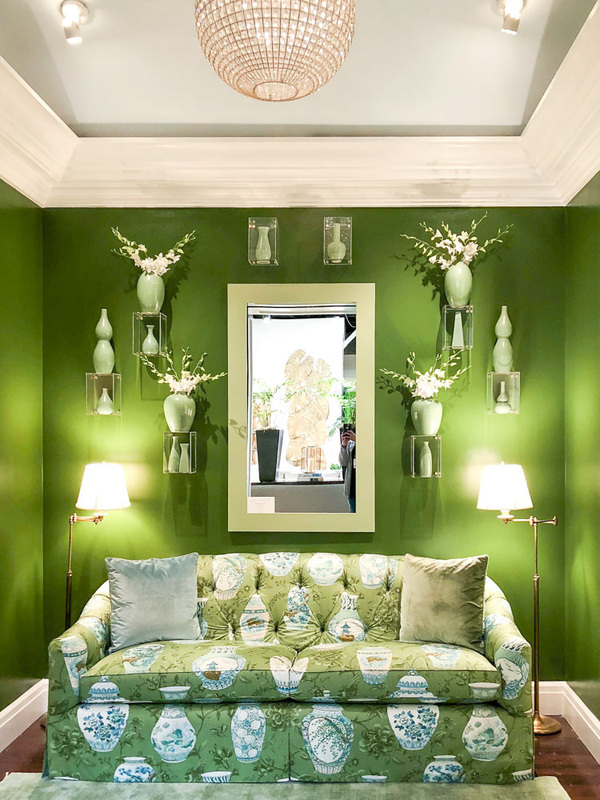 If you’re wanting to incorporate green in a more subtle, low commitment way, you can’t beat lamps (via Bungalow 5) or throw pillows (via Henredon) as shown below. 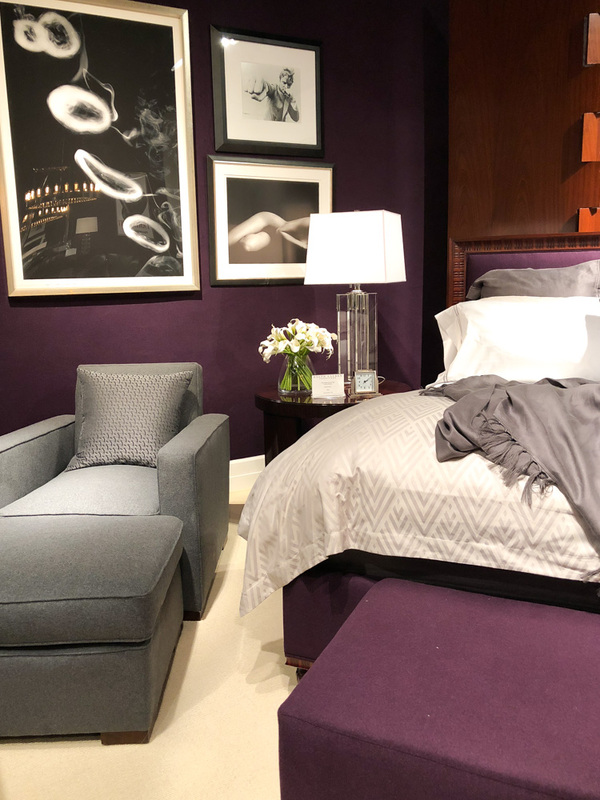 I wasn’t too surprised to see purples/violets at High Point Market given the 2018 Pantone color of the year is ultra violet, but it was interesting to see how various showrooms chose to pay homage to the bold and beautiful color. Some chose a softer approach and others went for the bold. Let’s start with the subtle at Bernhardt. 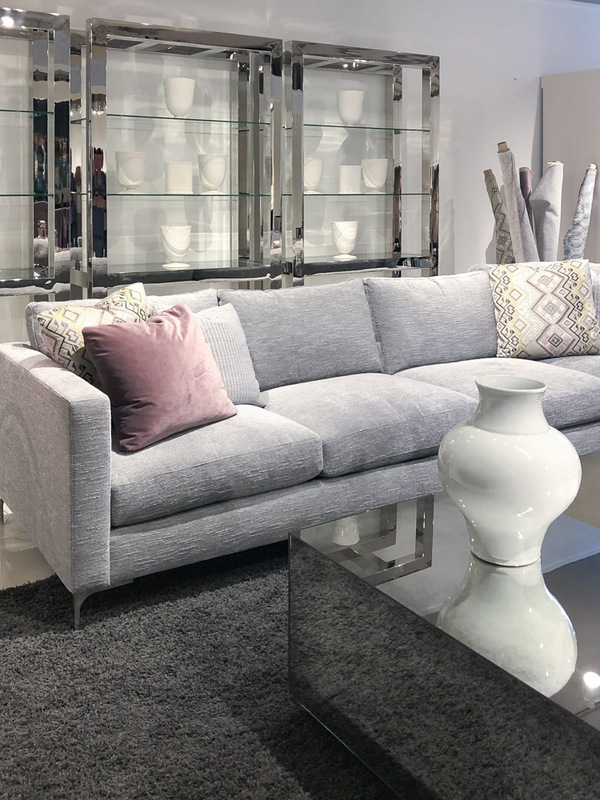 I love how the hue adds a luxe pop of color to a sleek gray sofa with a modern profile. 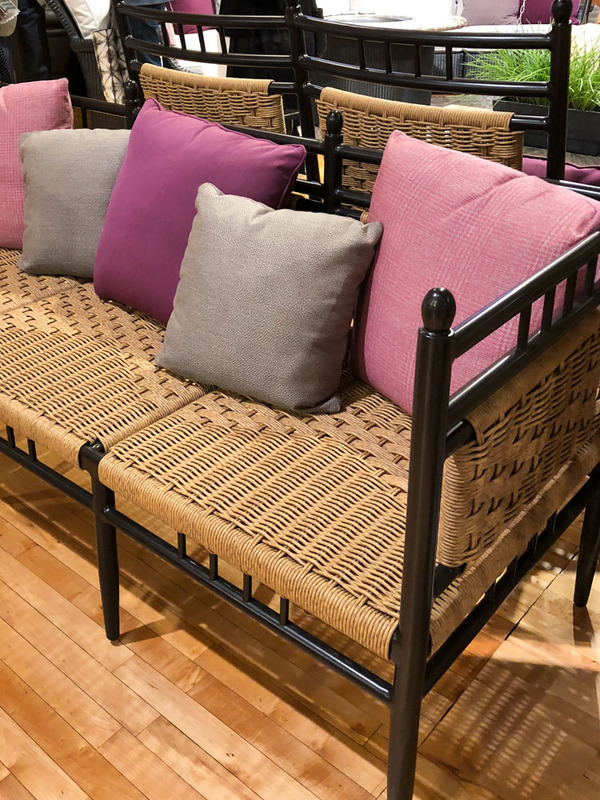 On the warmer side, Lloyd Flanders paired various purple/violet colored outdoor throw pillows on this gorgeous outdoor woven furniture piece. But again, see how well the gray plays with this color. It’s a great neutral pairing choice. At Thomasville, they had this beautiful accent chair that was so comfortable! 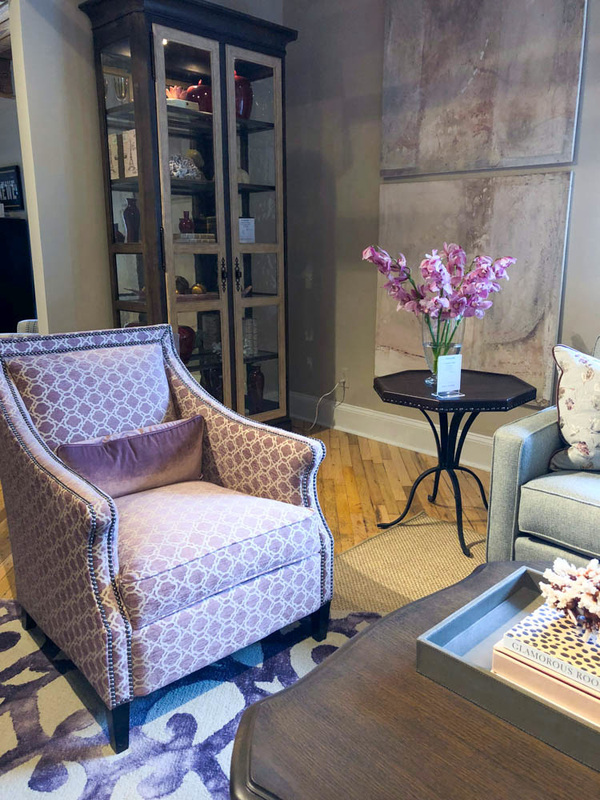 If purple is a color you know you’ll love for the long run, investing in an accent chair would be a great choice to add some color to a space. 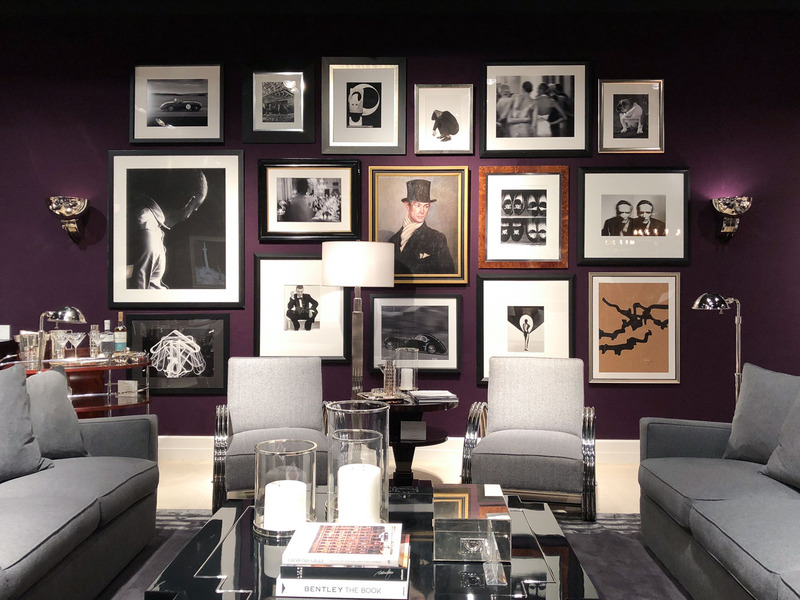 The boldest purple I saw during market was at Ralph Lauren Home inside E.J. Victor, and I am seriously inspired by this whole space for a dark, moody and jewel tone guest room. The wall color, black and white accents and chrome and crystal accents are simply spectacular. You all know I love metallics in every space- I love the glam, the shine and the luxurious vibe they give to furnishings and decor. There was no shortage of metallics at High Point Market, and I am excited to share my most favorite metallic finds. 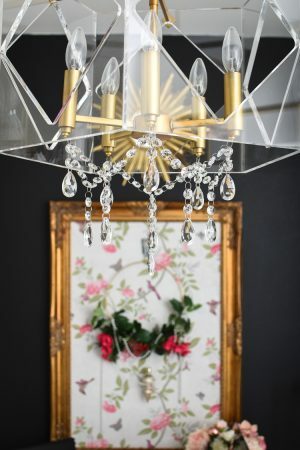 I was head over heels in love with this unique light fixture from Hudson Valley Lighting (Littman Brands). 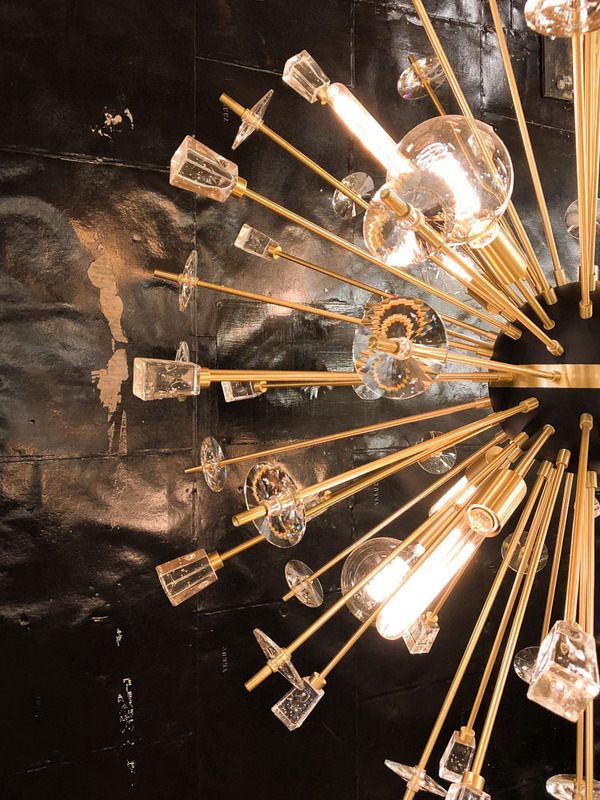 The brass, the black, the glass…I would love this over a dining table! Michael Dawkins Home, one of my favorite of the smaller showrooms, also had a ton of metallic accents and smaller furnishings/decor. 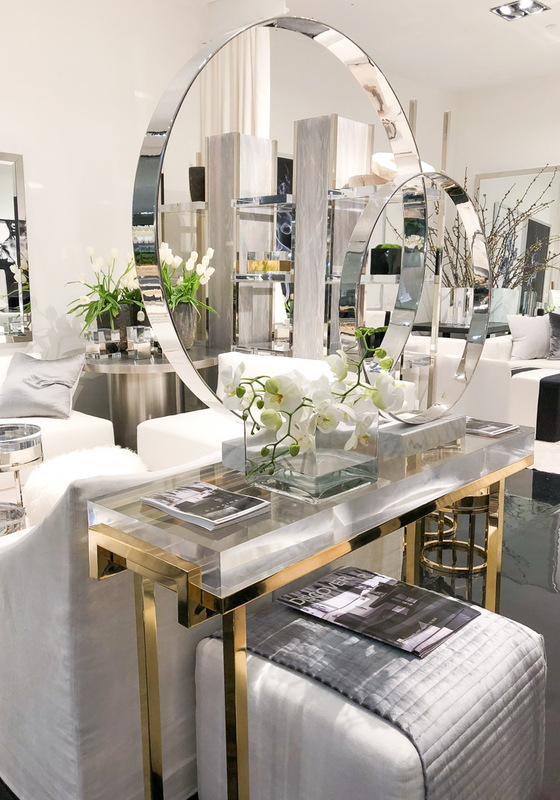 I especially love how thick the lucite top is on this console table. The pairing of the gold and chrome also looks really beautiful and stands out amongst all the white. A different approach to the usual metal finish on metallics can be seen below via Century Furniture. 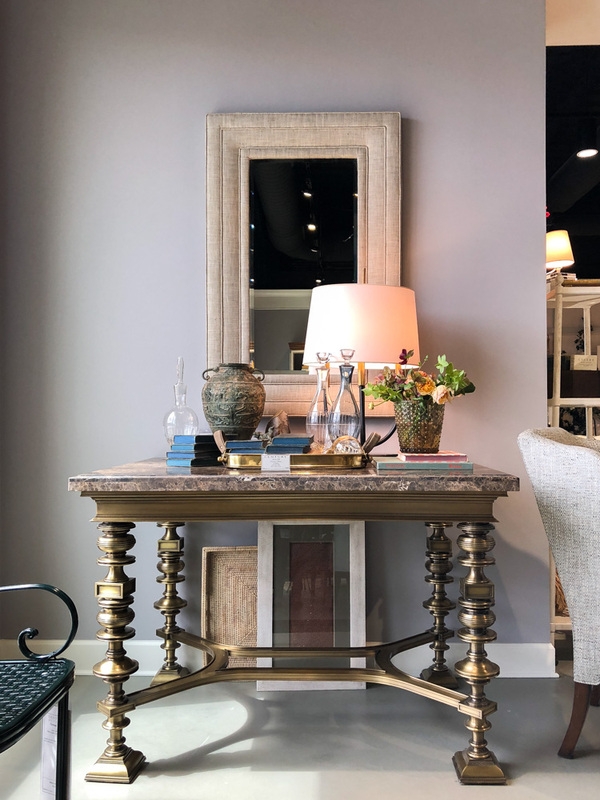 The rich, warm gold finish on the base of this table really highlights the beautiful details and adds a modern touch to a piece that feels a bit traditional and rustic. Modern History had so many beautiful pieces that incorporated metallic elements, but I wanted to showcase this one below because it’s so well done. 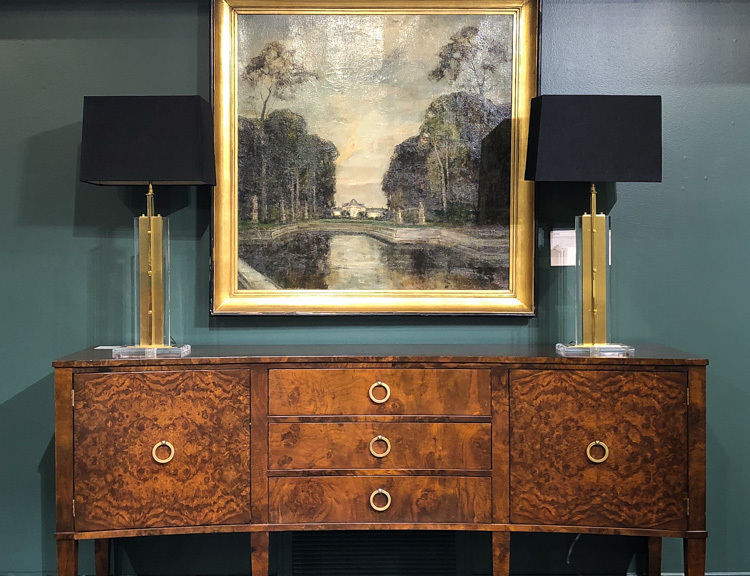 A traditional burled wood console table with simple, modern gold pulls adorned with brass and lucite lamps plus a scenic gold framed print. This is what good design is all about, and they really nail it at Modern History by mixing metals and honing in on what is trendy right now. 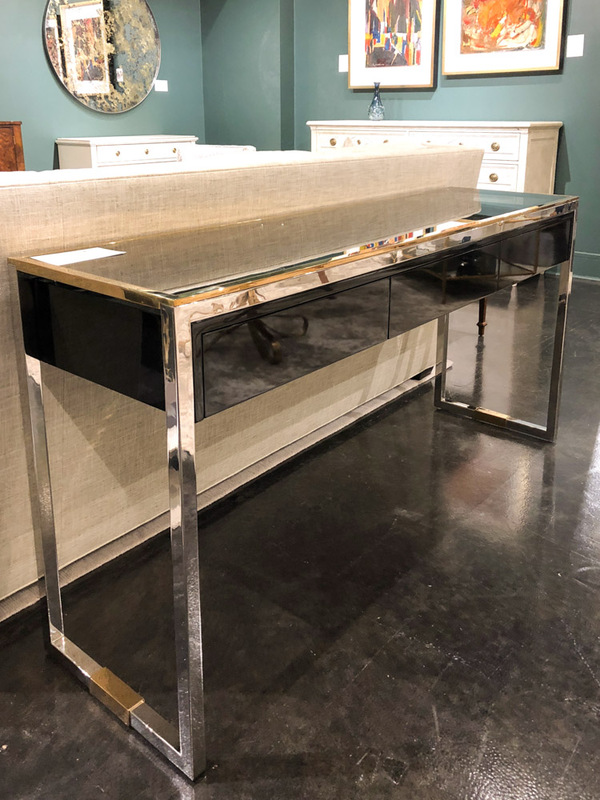 This is the console table of my dreams below! 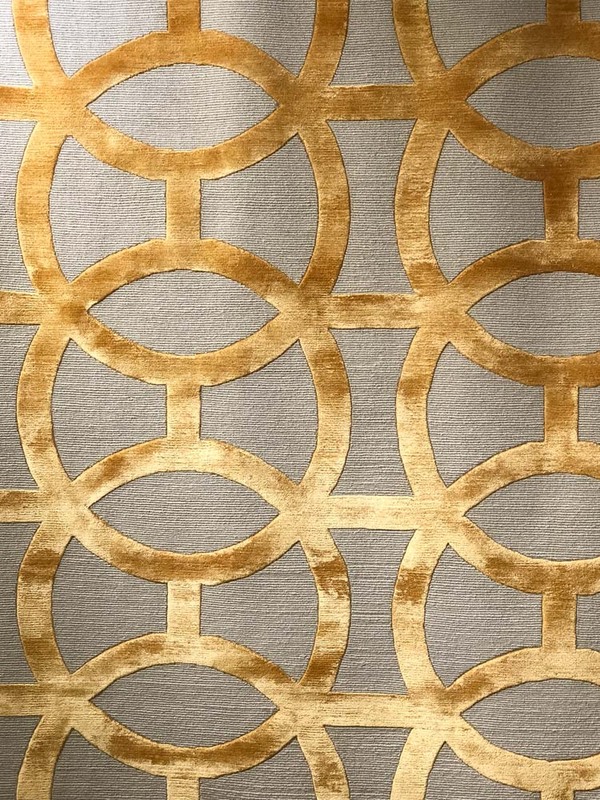 Another idea for incorporating metallics into a space is via an Exquisite Rugs piece. 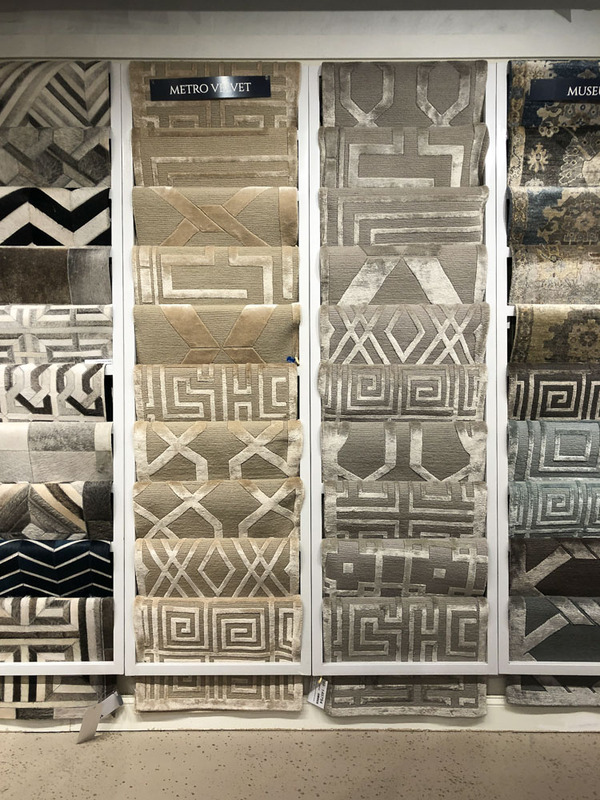 You’re probably wondering how a rug can be metallic, but once you see the photo below of their Metro Velvet collection, you’ll be convinced. These rugs are incredibly beautiful and heirloom quality. The craftsmanship is outstanding. This rug has me thinking about a spot for it in my home. Those rings look like a gorgeous gold in person. Black and white is chic, timeless and my fave color palette for at least the last five years or so. Therefore, I had to include some of the black and white highlights from High Point Market. 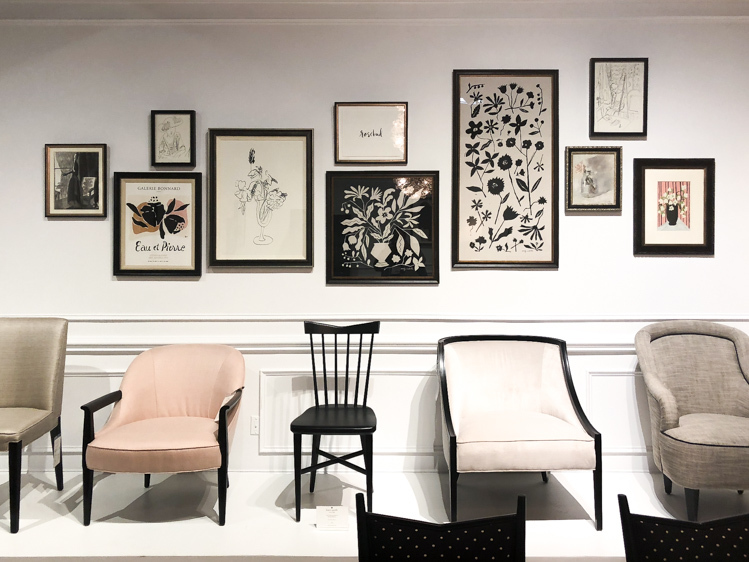 Kate Spade Home (part of E.J. Victor) is the queen of black and white home furnishings, and this gallery wall below has given me major inspo for filling up the vast white wall I have in my foyer. 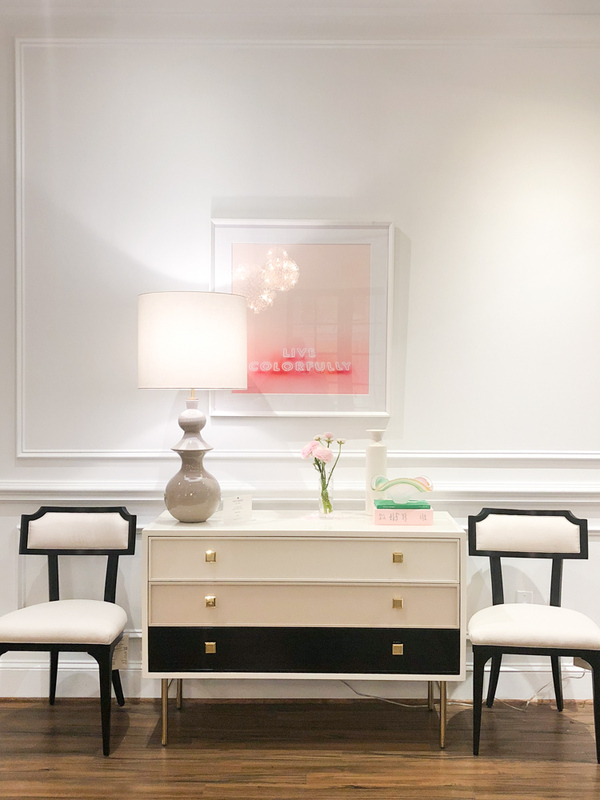 And this simple yet stylish Kate Spade Home vignette also packs a lot of punch with the color blocked drawers. 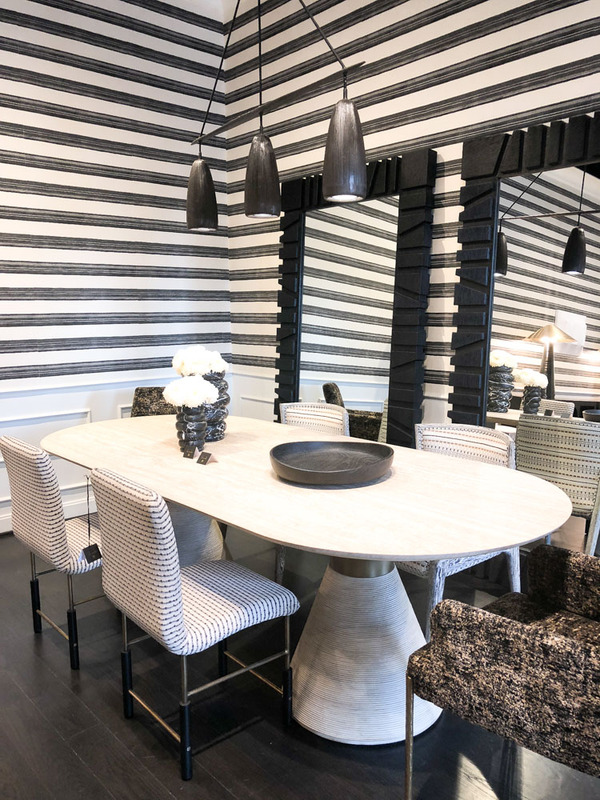 Kelly Wearstler’s design aesthetic is a bit edgy for me, but I don’t think I’d mind this dining room one bit! Those mirrors… I’m crushing on them hard. This whole desk set-up at Michael Dawkins Home really is so beautiful and I couldn’t stop noticing every detail. And finally, more Kate Spade…I’m sorry, but I’m a Kate Spade fan girl for life. 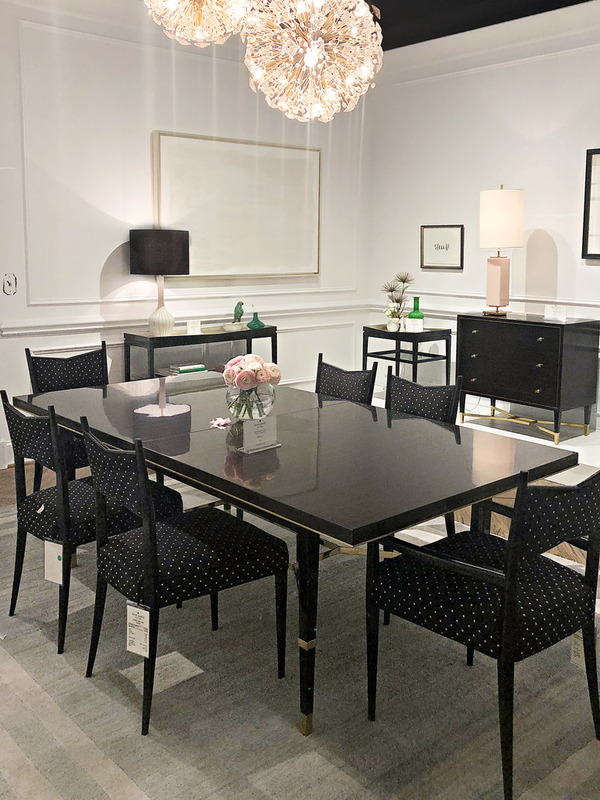 I have one more post about High Point Market coming up later this month and it’s tips and ideas I learned from visiting so many beautiful showrooms. 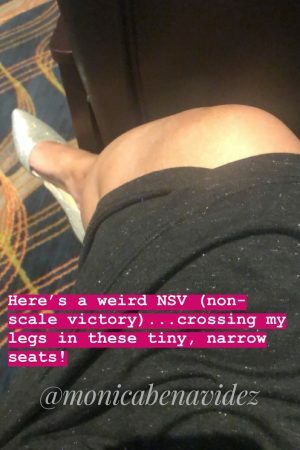 Thanks again to High Point Market for sponsoring this post. All opinions. 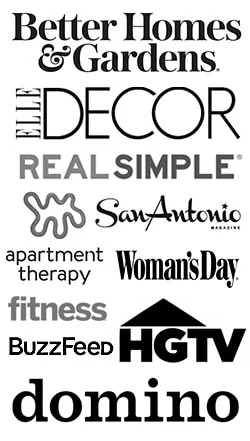 photos, commentary and subsequent obsessions with these brands are my own! xo.